Today, sports-TV viewers are accustomed to sitting in the driver’s seat with Jimmie Johnson as his No. 48 car tears around Daytona International Speedway at 200+ mph. Or peering over Tiger Woods’s shoulder as he crouches to read his final putt on the 18th green at Augusta National. Or sailing aboard Oracle Team USA’s yacht as it slices through the waves at the America’s Cup in pursuit of the Auld Mug. Without the efforts of Peter Larsson, however, these mind-blowing perspectives would never have been available to viewers at home. 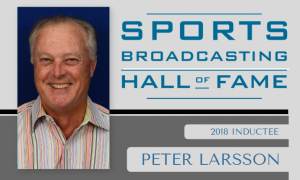 The co-founder of Broadcast Sports Inc. (BSI) and the wireless-camera and -audio systems, he has brought sports fans inside the action in ways never thought possible over the past four decades. The Sydney native earned his bachelor’s degree in electrical engineering at the University of New South Wales. To fulfill the three months of industrial experience required to complete his degree, he landed a job at Australian broadcaster Channel Seven and then was hired on full-time as an ENG engineer upon graduating. By the late 1970s, Larsson had begun working with fellow Channel Seven engineers John Porter and Dave Curtis to develop wireless microwave camera systems to assist in the broadcaster’s coverage of the Sydney-to-Hobart yacht race. The trio quickly realized that the RF system could be applied to auto-racing coverage and, in 1979, deployed the first-ever on-board Racecam on Peter Williamson’s car at the Bathurst 1000 in New South Wales. Though capturing an in-car perspective never seen before, the system weighed more than 70 lb. and offered only a locked-off shot. Over the next two years, Seven’s Racecam would decrease in size and add full pan-tilt-zoom capability. Larsson, Porter, and Curtis’s big break came in fall 1980, when a CBS production executive on location Down Under covering the Miss World Bodybuilding Championship stumbled on Seven’s broadcast of the Hardie-Ferodo 500. Spotting the onboard camera system, he immediately saw it as a perfect tool for the Tiffany Network, which had presented the industry’s first flag-to-flag coverage of the Daytona 500 a year earlier and was looking to expand its tools for live NASCAR coverage. A year later, Larsson, Porter, and Curtis found themselves at the 1981 Daytona 500, deploying their on-board cameras inside the car of Richard Childress and Terry Labonte for CBS Sports’ live coverage. The in-car camera became a sensation two years later, treating viewers to a driver’s-seat perspective of Cale Yarborough’s winning race at the 1983 Daytona 500. Today, NASCAR coverage would be almost unrecognizable without on-board cameras. Nearly four decades after their debut, three or more on-board cameras (usually driver, roof, and bumper) are typically deployed on four to six cars for an average Monster Energy NASCAR Cup and Xfinity race; even more are deployed on high-profile races. After commuting from Australia to the States for NASCAR races at Daytona, Michigan, and Talladega from 1981 to 1983 (through a subcontract arrangement with Channel Seven), in fall 1983, the triad pooled their funds and moved permanently to the U.S. to launch their own company, Broadcast Sports Technologies (BST). The fledgling BST operation was based in a five-bedroom house in Connecticut, with Larsson, Porter, and Curtis each claiming a bedroom and the other rooms serving as a lab, an office, and a basement machine shop. By 1986, the company was expanding beyond its work with CBS Sports, which renewed its deal with BST that year without the exclusivity clause included in the original contract. That year, BST began providing on-board cameras for IndyCar races on ABC and NBC and for ESPN’s NASCAR coverage. With more systems deployed on more events, BST opened a fully staffed engineering facility and office in Hanover, MD. BST’s systems moved off the racetrack and onto the high seas in 1987, when its RF camera systems sailed aboard Dennis Conner’s catamaran at the 1987 America’s Cup at San Diego Yacht Club. The systems have been a fixture at every America’s Cup since. In 1996, CBS Sports was looking to revamp its on-course–coverage strategy and was in search of a vendor to provide reliable wireless cameras, microphones, and comms without the need for massive — and unsightly — antenna towers. BST won the contract in a competitive vendor shootout and has been a staple on golf coverage for CBS and others for two decades. Throughout the ’80s and ’90s, BST continued to evolve its wireless systems while expanding to new properties like the Olympics, ESPN’s X Games, Formula 1, NHRA, American Le Mans Series, the Commonwealth Games, marathon coverage, presidential inaugurations, Pope tours, and even providing imaging systems that NASA installed in astronauts’ space suits. 1996 also marked another major transition for BST. The company was purchased by Wescam, a provider of gyro-stabilized aerial cameras, and changed its name to Broadcast Sports Inc. (BSI). In 2002, L3 Technologies acquired Wescam and BSI. BSI has continued to innovate since the turn of the century, transitioning from analog to digital systems in the mid 2000s and debuting its first HD wireless camera systems in 2007, as well as advancing its microphone and comms technologies. In 2011, the company launched dual-path in-car systems for auto racing, allowing two transmission paths to be delivered from a single transmitter. Other auto-racing highlights over the past decade have included the launch of driver helmet cams for IndyCar and NASCAR, replacing the a helicopter repeater with a ground-based antenna system for car racing, and deployment of RF cameras in the pits. Outside of auto racing, BSI has also debuted the landmark FollowCam system for Summer and Winter X Games, pylon cameras for NFL and college football, a wearable HD Ref Cam system, the launch of the ultra-reliable Blue Steel MIC1500 microphone line (which operates in the tightly controlled 1435 and 1525 MHz slice of spectrum), among other industry-altering technologies. Although Larsson is known to be one of the hardest workers in an industry filled with workhorses, he is also a devoted family man to Debbie, his wife of 27 years, and their three children: son Evan and daughters Kate and Natalie. He has also mentored countless individuals in the industry and is a beloved figure at production compounds across the globe. In 2015, Slate Capital Group acquired BSI from L-3 Communications. The company currently employs more than 200 people at its 55,000-sq.-ft. facility in Hanover and operates 13 RF mobile units. BSI opened UK office in 2011, to help deal with increased demand for RF broadcast technology overseas and has also launched a joint venture with Gearhouse Broadcast in Australia. In total, BSI services more than 500 unique venues across the globe, including 200+ golf courses and 100+ auto-racing venues. Despite 40 years in the business, the eight-time Emmy Award winner isn’t done yet — not by a long shot. He says he’s excited for BSI to confront the oncoming challenges presented by technologies like 1080p and 4K, as well as how to create new RF systems to confront the ongoing spectrum squeeze.